About: Cowboy Bob Wallace from Big Bear City, California. "After serving as the on site Volunteers coordinator at Camp Gulfside in Waveland, Mississippi in 2007 for several months, I began writing Christian/Gospel songs and here I am barely 3 years later releasing my 5th album project, "The Heavenly Nation". God is surely good to those who answer His call. 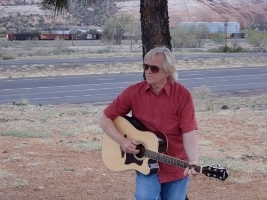 I am a singer/songwriter from Big Bear City, California." 1).How would you spend a million dollars if you had it? If I had a million dollars, I would 1st tithe a portion to the church. I would pay off some bills, then I would use a portion to finance my music ministry and set aside a portion for investing in retirement. 2).What was the craziest thing to happen in your life? Depending on what definition is given to your term craziest. If craziest means cool, it would have to be thee day I accepted the Lord Jesus Christ into my life. If craziest means dumb or bad, that would be hard to put my finger on, since I've done a lot of really dumb things. One thing that kind of sticks out in my mind is all the years I lived without using and developing my God given talent for music. If God gives us a talent and we don't use it, that would be the same as abusing it. 3).What kind of message is in your music? Why or for what reason do you write music? I love music, all kinds of music. There are times in my life that if music had not present in my life, I probably would have went nutts. I guess I write music because I feel an expression or statement that I want to make from time to time that is hard to say in normal conversation. I love have a melody come together with words that come from my inner being and not just words that seem to rhyme and kind of make sense. I want my songs to have a true meaning, to send a message that will somehow help someone to either be able to find the peace that I have with myself, or to possibly see the mistakes that I have made through lifes experience so that they might not make the same mistakes or at least know where to go for forgiveness when they do make mistakes. 4).What would you do if the world was going to end in 3 hours? That is a real tough one to answer due to my Christian beliefs. In the Bible, it speaks of the second coming of Our Lord Jesus Christ, to which no one knows when that will be. But in all fairness to your question and I can only answer that question in respect to knowing that fact. If I knew that the second coming would be in three hours, I would hope that I could lay my selfish human interests aside and spend that time trying to warn others and attempt leading as many souls to salvation in the Lord Jesus Christ. I would hope and pray that my Faith is at least that strong. 5).If you were a professional sportsman, what sport would you play? That would have to be racketball. I don't play it anymore but that was a game I used to really love to play and wasn't half bad at it.